For the past few weeks I switched over from PCs to Macs. I bought a refurbished MacBook and a 23" Apple Cinema Display as a desktop replacement. Previously I had never used OS X before but so far I have found it to be very easy to use. The learning curve is very low for what I use it for. It syncs in perfectly with my iPod (I would have been very surprised if it didn't) and I was able to transfer over all my old files. I ripped all my CDs to iTunes and I just started using iPhoto to edit my photos. I managed to synced my phone with iCal and Address Book. I also found install and uninstalling applications to be very easy. I liked my MacBook so much I bought a MacBook Pro too. I have not totally switched over as I running Windows (for applications such as Visual Studio) under VMWare Fusion. I had originally planned to use boot camp but I found running Windows virtually to be a better solution as I can use both operating systems at the same time and with the Unity feature I can run Windows applications inside the OS X desktop environment. Installing operating systems virtually is very useful as I don't need to partition my hard drive and I can just delete the OS when I don't need it anymore. 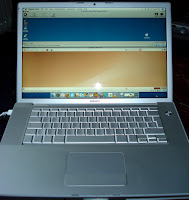 Creating virtual machines allowed me to install and try out a few Linux operating systems under VMWare. Currently I have Ubuntu 7.04 and Kubuntu 7.04 installed and I am trying them out. Both Mac's I bought came with the standard amount of RAM (1GB for the MacBook and 2GB for the MacBook Pro) as Apple charge stupid prices for RAM upgrades so I bought extra RAM from Crucial and fitted them myself (very easy to do as long as you have the correct screwdriver). All in all I found Macs to be great to use for every day tasks but the only downside is that both my MacBook and MacBook Pro generate more heat than a radiator!